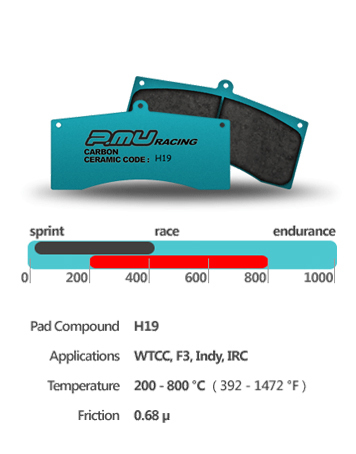 P.Mu H19 is the pad of choice for those drivers with a desire and ability to handle very high friction. This is a ‘competition-only‘ pad designed to offer the very best performance in torque, feel, fade resistance and release. H19 will wear quicker than H16-03 for example, but will offer higher levels of friction for long periods of time. H19 won’t start to show signs of fade until around 800+°c. Very high initial ‘bite’ and good release characteristics means the driver can attack the braking area with the confidence that they will be the last on the brake pedal.